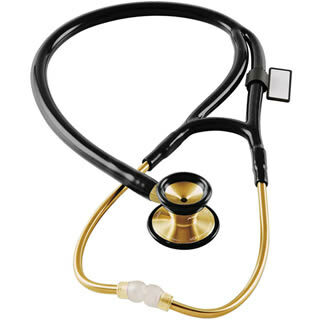 Constructed from gold-plated premium-grade acoustically-superior stainless steel, the MDF® Classic Cardiology™ Stethoscope >22K Gold Edition delivers accurate auscultation of heart, lung, and Korotkoff sounds with acoustic integrity and clarity. An ergonomic design ensures comfort for the doctor and patient, even during extended use. The 22K Gold Edition Classic Cardiology™ is the ultimate diagnostic instrument with unmatched performance, durability, and aesthetics. With its extra-deep cone-shaped bell and ultrasensitive diaphragm, this cardiology stethoscope detects the entire frequency range required by cardiologists. The handcrafted gold-plated stainless steel dual-head chestpiece is precisely machined and hand polished for the highest performance and durability. The patented full-rotation acoustic valve stem features SoundTight™ GLS technology to seal in sound, and the green indicator dot allows the user to easily identify the active sound channel. The chestpiece is fitted with an ultrasensitive diaphragm sealed with a non-chill retaining ring to provide a secure acoustic transmission for heart and lung sounds of 100Hz to 1000Hz. The extra-large cone-shaped bell, crowned with a non-chill bell ring, provides greater sound amplification, isolation of low frequencies (20Hz to100 Hz), and patient comfort. Hand polished, pre-angled gold-plated stainless steel headset features a patented internal dual-leaf spring construction for durability and custom fit. Soft silicone ComfortSeal™ eartips are clear for hygienic purposes and conform to the ear to seal out extraneous noise while ensuring comfort during extended use. Patented SafetyLock™ eartip adaptors lead the industry in user safety. MDF® Acoustica™ from MDF Instruments USA on Vimeo.